This book presents a number of interesting and useful aspects and facets concerning the clinical features, properties and therapeutical management of this condition. Dr. H. Mejía-López et al. present an interesting survey of the world-wide epidemiologic aspects of infectious conjunctivitis. Dr. U. Ubani evaluates conjunctival symptoms/signs participating in the clinical features of this disorder. Dr. A. Robles-Contreras et al. discuss immunologic aspects underlying possibly the conjunctivitis. Dr. Z. Pelikan presents the cytologic and concentration changes of some mediators and cytokines in the tears accompanying the secondary conjunctival response induced by the nasal challenge with allergen. Dr. S. Sahoo et al. 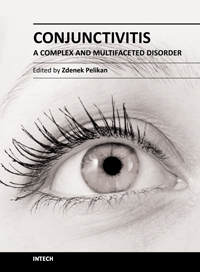 summarize the treatment and pharmacologic control of particular clinical forms of conjunctivitis in general practice. Dr. S. Leonardi et al. explain the basic pharmacologic effects of leukotriene antagonists and their use for the treatment of allergic conjunctivitis. Dr. J.A. Capriotti et al. evaluate the therapeutical effects of various anti-adenoviral agents on the acute conjunctivitis caused by adenovirus. Dr. V. Vanzzini-Zago et al. assess the prophylactic use and efficacy of "povidone-iodium solution", prior the ocular surgery. Dr. F. Abazi et al. present the clinical features, diagnostic and therapeutical aspects of "neonatal conjunctivitis". Dr. I.A. Chaudhry et al. review the special sub-form of conjunctivitis, being a part of the "Trachoma". Dr. B. Kwiatkowska and Dr. M. Maślińska describe the clinical, pathophysiologic and immunologic features of conjunctivitis. Dr. S. Naem reviews the conjunctivitis form caused by Thelazia nematodes, occurring principally in animals.